Steven Spielberg is one of the top Hollywood directors whose very name conjures endless excitement and anticipation, thanks to a 40-year career of directing and producing some of the most famous blockbusters of all time from Jaws to E.T. to the Indiana Jones series. However, some find his less-accessible films – i.e. ones that tackle more serious and dramatic issues rather than please a mainstream crowd – to be a bit of a mixed bag, and this reviewer is no exception; while he has definitely made some classics like Schindler’s List or Saving Private Ryan, others just never caught fire like Lincoln or War Horse. Thankfully, Spielberg doesn’t have that problem with Bridge of Spies, not just because it’s a thoroughly entertaining drama in its own right, but also because for this one, he’s called in some help from the Coen Brothers. Yes, you read that right: acclaimed filmmakers Joel and Ethan Coen, known for their bizarre mixture of deadly intense thrillers like Fargo and No Country For Old Men as well as goofy comedies like The Big Lebowski and Burn After Reading, are co-credited for the screenplay along with Suite Française’s Matt Chapman. Just the thought of a Coen Brothers-penned script being made by none other than Steven Spielberg is wildly exciting, and it’s fortunate that Bridge of Spies brings out the best of all of them. Set at the height of the Cold War in 1957, insurance lawyer James B. Donovan (Tom Hanks) is tasked with defending Russian spy Rudolf Abel (Mark Rylance) in a case that’s doomed from the start, but things become even trickier when a U2 spy plane is downed over USSR territory and its pilot, Francis Gary Powers (Austin Stowell), captured and held by the Soviet Union. With Abel as a useful bargaining chip, Donovan is sent by the CIA on a covert mission to East Berlin to negotiate a prisoner exchange for the incarcerated pilot. When you really analyse the plot, it’s mostly a very basic story of a man trying to do the right thing in lieu of a greater historical context, but Spielberg and the Coens are intelligent filmmakers to craft it into something that can genuinely have you on the edge of your seat. Spielberg, for instance, relishes in several set-pieces that can be as simple as a man walking through a subway in Brooklyn or someone else riding a bike as the Berlin Wall is being built, but he twists them to become an intense chase sequence where it’s impossible to tell who’s chasing you or not, or a dramatic establishing scene where distress and moral injustice is happening swiftly in the background. On top of that, the Coens inject their trademark straightforward dialogue into scenes of characters talking about insurance settlements, and also some off-kilter moments of dark comedy such as Abel’s desire to find his dentures while FBI agents raid his flat for evidence of his spying. It’s moments like these that come courtesy of both Spielberg and the Coens’ best abilities to entertain their respective audiences, and the merging of their talents makes for some unexpectedly entertaining contrasts in both style and substance. The Cold War in and of itself is a fascinating time in modern history, so it is extremely intriguing whenever the film decides to indulge in the many ways of life and pieces of technology both the US and the USSR had at the time. A whole sequence, for instance, is dedicated to showing the in-training pilots – and by extension, us – the mechanics and the little gadgets that make a U2 spy place work, and it’s almost like a history lesson done by people who are genuinely passionate about what they’re talking about, making things far more interesting than the standard History GCSE or A-Level course at school. It’s also gripping to see re-enactments of the attitudes of people at the time as well, particularly as Donovan and his family continues to be ostracised by police, neighbours, work colleagues and the press – including a scene where bullets are fired in the dead of night outside their family home – just because he chooses to promote a fair trial for someone who has proven to be a Russian spy. The McCarthy-era politics reign supreme in the minds of many Americans in this film, and it’s never dull to see just what lengths people would have gone to in order to voice their oppression to Communism and anyone associated with it. Spielberg regulars, like cinematographer Janusz Kamiński and star Hanks, do great work here as usual, while newcomers such as composer Thomas Newman – filling in for John Williams after a health scare – and actor Mark Rylance (who will reunite with Spielberg in next year’s The BFG as the titular character) also stand out as collaborators on what is a truly engaging film, one of the director’s strongest in years. Plus, Bridge of Spies is a far better Coens-penned movie that they didn’t direct than Unbroken was – that alone is enough to recommend this movie. 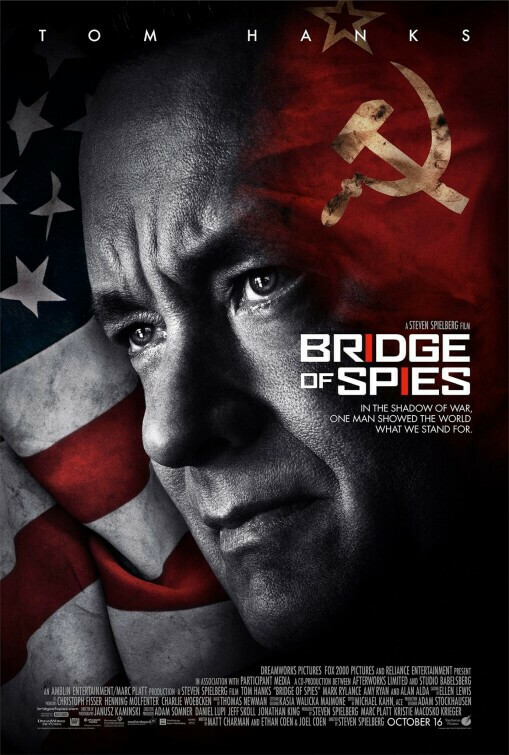 Bridge of Spies is a heavily entertaining collaboration between director Steven Spielberg and co-writers Joel and Ethan Coen, who all work wonders with a fascinating period of modern history – the height of the Cold War – that brings out the best of their individual creative processes.